We continue our analysis of the Gehan data by fitting a proportional hazards model. This is the same dataset used as an example in Cox’s original paper: Cox, D.R. (1972) Regression Models and Life Tables, (with discussion) Journal of the Royal Statistical Society, 34: 187–220. The first task is to read and stset the data. I also create a dummy variable for treated. Stata reports hazard ratios unless you specify the option nohr. 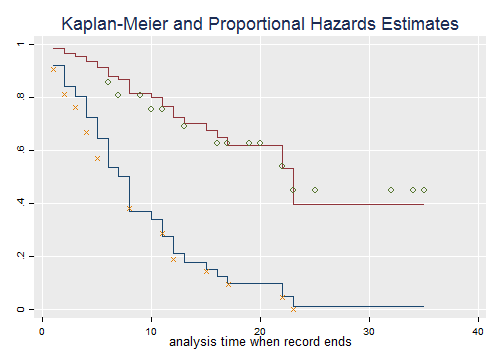 R reports log-relative risks, but also exponentiates the coefficients to obtain hazard ratios. We see that the treatment reduced the risk of relapse by almost 80% at any duration. There are various options for handling ties. Cox’s original proposal relies on the discrete partial likelihood. A closely-related alternative due to Kalbfleisch and Prentice uses the marginal likelihood of the ranks. Both methods are computationally intensive. A good fast approximation is due to Efron, and a simpler and faster, though somewhat less accurate, method is due to Breslow and Peto. See the notes for details. In terms of our software, Stata implements all four using the options exactp, exactm, efron and breslow. The default is breslow, but I recommend you always use efron. R implements all but the marginal likelihood, using the argument ties, with possible values “breslow”, “efron” and “exact”. The default is “efron”. Let us compare them all. As you can see, Efron’s approximation is closer to the exact partial likelihood than Breslow’s. The marginal likelihood is even closer. Cox reported a log-likelihood of -1.65 in his paper, which he obtained by evaluating the likelihood in a grid of points. The more exact calculations here yield -1.63, so he did pretty well by hand (see page 197 in the paper). One way to test proportionality of hazards is to introduce interactions with duration. In his original paper Cox tried a linear interaction with time. We will do the same, except that he worked with t - 10 to achieve more orthogonality and we will use t.
texp(expression) to specify a function of time _t, typically just time, with texp(_t) or log-time with texp(log(_t)). Note: Variables in tvc equation interacted with _t. We find no evidence that the treatment effects changes linearly with time. BTW we didn’t need to specify texp(_t) because this is the default. Note: Variables in tvc equation interacted with _t>10. We get a Wald test for the interaction term of z = 0.01 and twice a difference in log-likelihoods of 0.00, so clearly there is no evidence of an interaction between treatment and time at risk. Note that these are exactly the same results we got with tvc() and texp(). The Wald test now yields -0.73 (a chi-squared of 0.53), and the likelihood ratio test concurs, with a chi-squared of 0.54 on one d.f. The estimated risk ratio is larger after 10 weeks, but the difference is not significant. Note that these are exactly the same results we got with tvc() and texp(). Another way to check for proportionality of hazards is to use Schoenfeld residuals (and their scaled counterparts). You can obtain an overall test using the Schoenfeld residuals, or a variable-by-variable test based on the scaled variant. 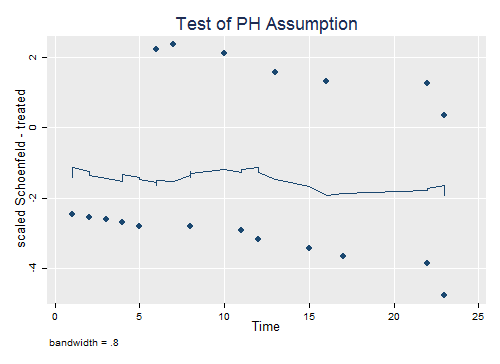 In this case, with just one predictor, there is only one test, but we’ll see later an example with several predictors. Stata and R offer several possible transformations of time for the test, including a user-specified function, but chose different defaults. 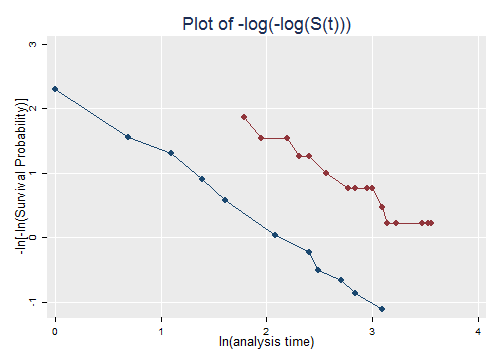 In Stata the default is time, but one of the options is km for the Kaplan-Meier estimate of overall survival. In R the default transform is “km” for the K-M estimate, but one of the options is “identity” for time. The emphasis in the Cox model is on hazard ratios, but one can calculate a Kaplan-Meier or a Nelson-Aalen estimate of the baseline survival, as shown in the notes. The baseline is defined as the case where all covariate values are zero, and this may not make sense in your data. A popular alternative is to estimate the “baseline” at average values of all covariates. 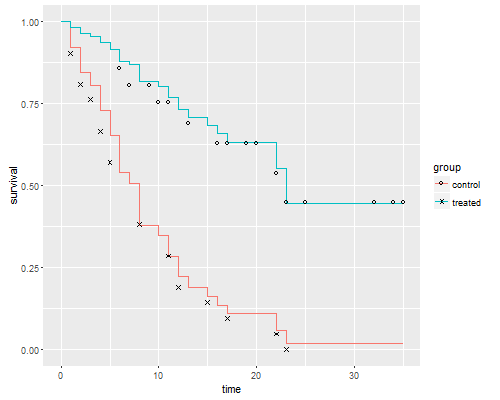 In our case, a much better approach is to estimate and plot the estimated survival functions for the two groups. 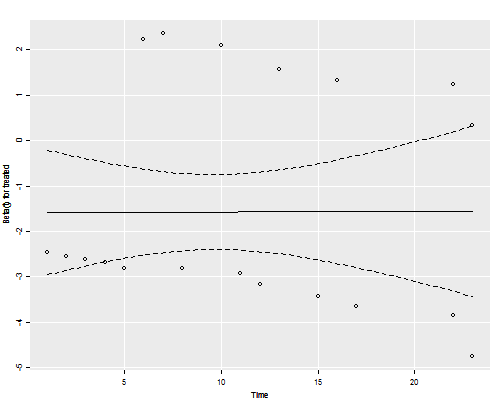 Stata makes this very easy via the stcurve command. It is instructive to compute these “by hand” and compare them with separate Kaplan-Meier estimates for each group, which I will plot using different symbols for treated and controls. The plots connect the point estimates using a step function. The figure looks just like Figure 1 in Cox’s paper. 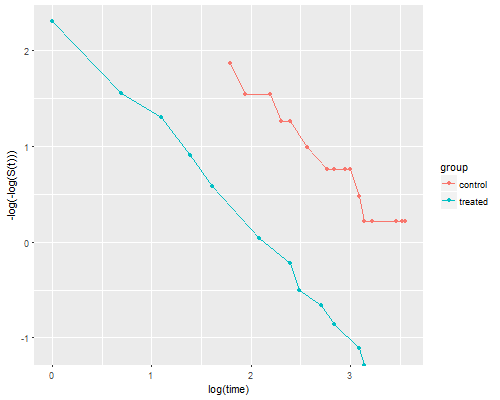 If the purpose of the graph is to check the proportional hazards assumption, a much better alternative is to plot the log-log transformation of the survival function, namely -log(-log(S(t)), against log(t) for each group. Under the proportional hazards assumption, the resulting curves should be parallel. This plot is useful because the eye is much better at judging whether curves are parallel than whether they are proportional. The two lines look quite parallel indeed.